"A true man of God. Jack lived his life to serve Christ. I'm..."
"I'm sorry to hear of your loss. You are in my prayers at..."
"So sorry to hear about your loss. Praying for you and your..."
"Oh how sorry I was to get the sad news about this..."
"Jack and I worked together at the Governor's Office of..."
Clifton "Jack" Boyd Muse, 86, of Walker, LA passed away on Friday, July 13, 2018. 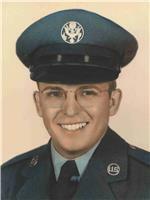 He served and defended his country in the United States Air Force for over 21 years before retiring. He served his Lord as a deacon with Live Oak Baptist Church and a member of The Gideons. Jack was a loving and devoted father, grandfather, great-grandfather, brother and friend and will be missed dearly by all who knew him. Visitation will be held at Judson Baptist Church, Walker, on Wednesday, July 18, from 9 a.m. until service at 11 a.m., officiated by Rev. Johnny Morgan. Burial will follow at Judson Baptist Cemetery. He is survived by his sons, James B. Muse, and Carl Muse and wife, Pamela; grandson, Jeremy Muse and wife, Stacie; great-granddaughters, Isabella and Madelyn Muse; sister, Annette Anderson; as well as other family and friends. He was preceded in death by parents, Harvey and Naomi Wesley Muse; and brother, W.O. Muse; former wife and mother to his children, Margie Young Muse. In lieu of flowers, donations may be made to the America . Please share your condolences at www.sealefuneral.com.